I have been off the grid for the last three weeks, as you might have been able to tell from the lack of blog posts and social media posts this past month. In late January and through early February, I was down in southern Argentina in Patagonia, a mythic region with wild, beautiful and rugged mountains–as shown on the logo of the clothing company Patagonia and in the images in this blog post. My latest foray to Patagonia was for Vertical Shot Expeditions, where I was leading a photography trek that circumnavigated both the Cerro Fitzroy and Cerro Torre ranges and also traversed the Patagonia Ice Cap. The trek was an 8-day outing with 65 to 70 pound backpacks in some extremely rugged terrain. It was a fair bit harder than even I thought it would be, but nonetheless it was an incredible trip. 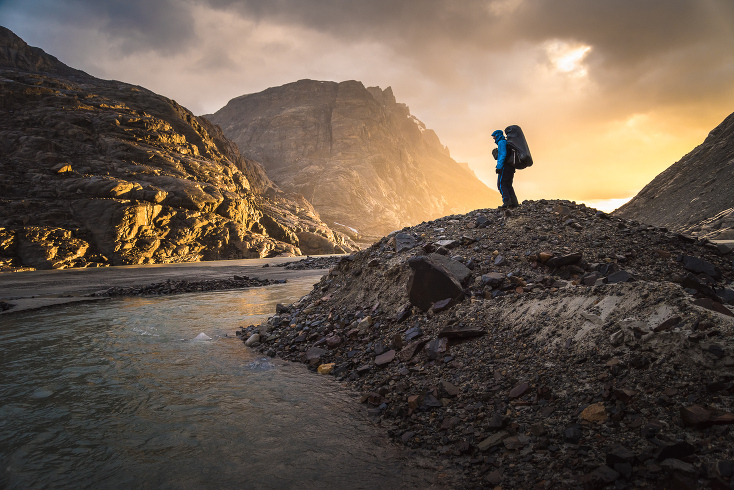 As you can imagine, this wasn’t your average photo trek but more of a window into an adventure sports photographers world, which included all the normal suspects: serious suffering, long days, early mornings, and some spectacular vantage points. It was a full-on expedition and felt more like a mountaineering trip than a hiking or backpacking trip. For more than a decade, ever since I saw the Glacier Grey in Torres del Paine National Park in southern Chile, I have wanted to get onto the Patagonia Ice Cap and explore the more remote parts of the ice cap. When Vertical Shot Expeditions approached me to lead this trek, my immediate response was “Yes!” As you can see from the images here in this blog post, we had some spectacular weather. In fact, we had the best weather I have ever seen in almost a year’s worth of travel in southern Patagonia. I fully expected to have lots of stormy day where we could’t see anything but our feet. Luckily, we were able to see the entire ice field and both Cerro Fitzroy and Cerro Torre in spectacular fashion. The Patagonia Ice Field is the third largest sheet of ice (over land) on the planet behind Antarctica and Greenland. The Patagonia Ice Field, known as the Hielos Continentals in Spanish, is 350 kilometres (220 miles) long from top to bottom and and has an area of 12,363 km2 (4,773 sq mi). In other words, it is huge. Sadly, recent science has shown that the Patagonian Ice Field is shrinking 1.5 times faster in recent years than it ever has as a consequence of global warming. As shown above, in the opening image of this blog post, we had some spectacular clouds on a few mornings and evenings. The above image was shot from our camp behind Cerro Torre looking south on the ice field at sunrise. 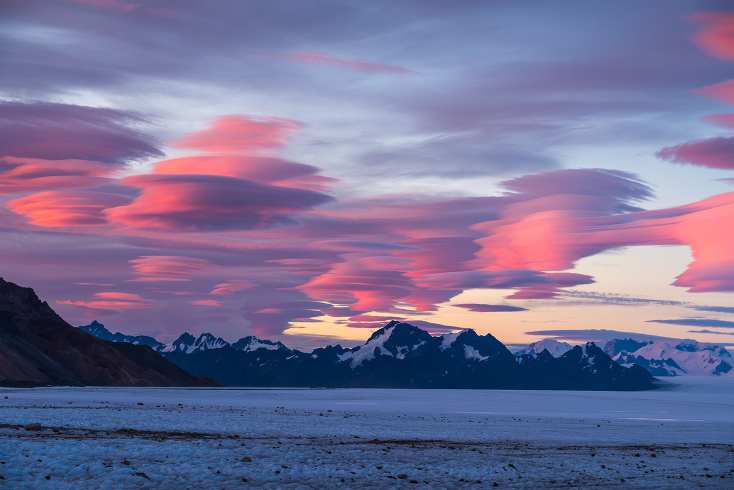 These UFO-like clouds were lit up by the rising sun and while packing up camp for an early morning departure we all stopped to take photographs. This might well be the most striking and unique image from the entire trip. I am still editing the nearly 5,000 images I shot on this expedition so it is hard to tell just yet. 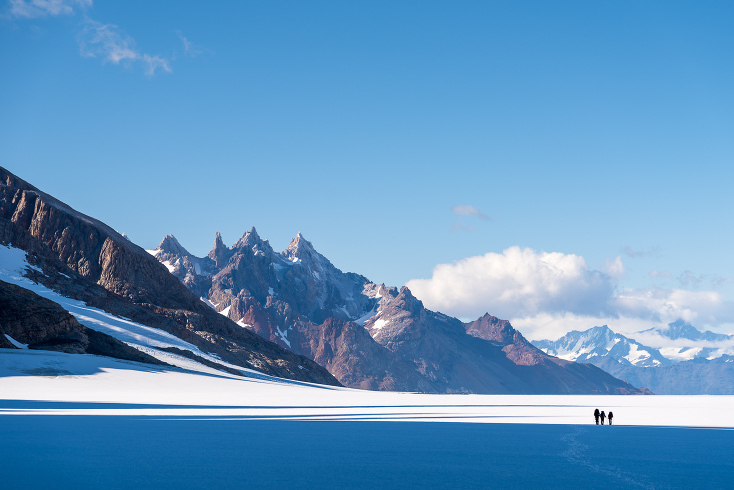 Below is an image where you can see part of our group roped up and hiking down the ice field. The scale of the ice field is mind-boggling and very hard to wrap your head around, even when you are out there standing on it. Above, Richie Graham stops for a break on the moraine, just below the Paso Marconi, to take in the view. This morning was a little stormy with light rain and mild winds. We got an early start at 5 AM and when the sun came up, as shown in this image, it made for dramatic backlit images with golden light. Ever since 2012, when Cesare Maestri’s bolt ladder was removed from the Southeast ridge of Cerro Tore, hiking up and over Marconi Pass and onto the glacier is now a fairly standard hike for climbers because the standard route on Cerro Torre is now the ice route on the west face, which faces the ice cap. Fit climbers can make the approach in a few days normally, some can do it even faster but it is a serious approach, which is often done in less than stellar weather conditions when trying to get a good weather window for the climb. While this photography trek wasn’t focused on climbing, when you are in and around the Chalten and Torres ranges, the climbing legends and lore are inescapable–and fascinating. As a climber myself, I was itching to get on something and do some climbing but that will have to wait for a future trip. A big part of this trip was to get off the beaten path and hike to the backside (the western face) of Cerro Torre, which is usually only seen by climbers. As shown in the image below, we had very clear skies over Cerro Torre and were able to see it for two or three days from various vantage points before and after we camped right behind it on the glacier. For myself, camping behind Cerro Torre was like camping in front of a giant cathedral. I have wanted to see this peak, and Cerro Fitzroy for many years. Having a 24 hour period of perfect weather to bask in the glory that is Cerro Torre was quite special for me personally–especially because we got to see the west face, the side that is rarely visited except by climbers. Pictured above are Juan Aguada (our lead guide), Richie Graham and Stefan Blawath roped up and hiking on the ice field and headed south towards our camp behind Cerro Torre. This image was shot just after sunrise and in the far distance you can see the opposite side of the ice cap, which looks close but is in reality a two to three day hike to get to the other side. Below is an image shot just after we made it up onto the Marconi Pass and onto the Patagonia Ice Field. Just below our position here is an extremely steep and exposed 600m (2,000 ft) waterfall which we had to climb through with full packs on. For some sections of the waterfall, we roped up and were belayed by our guides, Juan Aguada and Rafael Heer. This was only the second trip in my entire life where I was guided, but in certain sections where there was really no trail at all I was happy to have the guides. Of course, since this whole trip was set up as a photo trek, for liability purposes we had to have guides. As I sit here in Hawaii waiting for some big waves, I am still processing this incredible trip in Patagonia as I work through the images. It truly was a “trip of a lifetime” and one of the most incredible adventures I have had in the last few years–though I have had quite a few that fit into that same category. My thanks to Vertical Shot Expeditions for tapping me for this adventure and to Juan and Rafael for being such amazing guides and good fellows to hang out with. They were top-notch professionals and I personally loved hearing about Juan’s ascents of both Cerro Torre and Cerro Fitzroy. We are already scheming to make this happen again in late 2017 so stay tuned if this sounds like an interesting trip you would like to go on. Having had such good weather on this trip, I am a little worried about my luck the next time around. I would love to see some full-on Patagonia weather on the next one–at least for a few days. Stay tuned for a more in-depth report on this trip in an upcoming issue of the Newsletter.